I called it the Pumpkin house. It’s definitely not a fair title but it’s my way of railing against the struggles we went through in photographing this wonderful home. 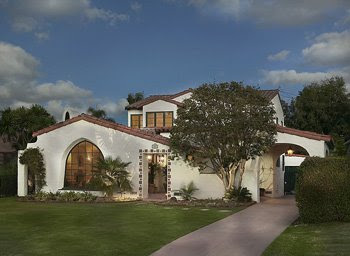 The home is featured in the November-2008 issue of San Diego Home and Garden. We started at 5:00am to catch the sunrise on the back of the home. With digital shooting, I take a series of exposures, i.e. interior lights on, lights off, no sun, a little sun, more sun etc. In post production, I select the exposures that represent my lighting style and blend them together. A use a little of this window tint, a little of that patio light streak until I have produced an image that really speaks to all the features and mood that we (my client and I) want to convey. We then moved inside. The interior designer, Kristen Victor, of Kristen Victor Designs worked directly with us. Her attention to detail was rivaled only by my own need to obsess over minutia. We did work well together. Along with Ione Steigler of IS-Architecture, the architect for this project, we moved from one room to the next, zeroing in on our shot list from a prior scouting trip. Every once in a while I will run up against a color that doesn’t reproduce well on “film”. Or in this case, digital film. To the casual observer, the colors looked great. 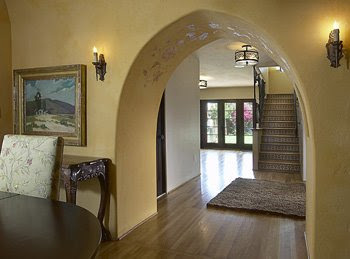 They’re soft muted tones that speak to the 1920’s Spanish adobe era. But to a photographer’s eye and the CMOS chip, they were loud and garish. I knew I’d have to deal with some saturation issues in post production, But on set, we had to be particularly careful of any color reflections and contamination. For example, one can easily direct a strobe at a white ceiling and use that soft reflected light to help fill in the shadows in a particular shot. In this situation, if we had done that, there would have been pumpkin and mustard colors everywhere contaminating the furniture, floors and other décor. So the answer was to make sure that any light we used was directed light, not reflected. Controlled soft boxes were used extensively along with flagging out any unwanted “spill” light. Any accents required spots. Any remaining contamination I will take care of in post production. The project went very well and ended with all of us out in the front around 4:00pm. This is where patience comes in, again. It’s like the sunrise shot only in reverse. Ione and I established the angle we liked then sandbagged the tripod. The last thing you want is any kind of camera movement. This will throw off the registration, or alignment, of your timed exposures. Once the angle is set, that’s when everyone else says” good job, I’m outta here”. That’s when my assistants and I will break out the camping chairs, send someone for coffee and settle in until after dark. See the feature in the November issue of San Diego Home and Garden. Coming up… My trip to Sacramento to photograph the Green Builders “Home of the Year award for best energy efficient Home”.